Clever Choice Voice+ is a bilingual talking blood glucose monitor from Simple Diagnostics. 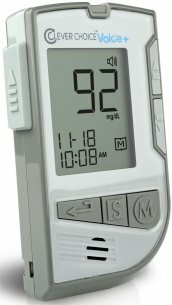 The device builds on the high standards seen in the original Clever Choice Voice glucose meter but also provides additional benefits and features for patients, based on feedback that have been received from both doctors and patients currently using a Simple Diagnostics glucose meter. The Clever Choice Voice+ totally audible blood glucose meter is excellent for the blind and low vision diabetic patient. The Clever Choice Voice+® requires No Coding, which means fewer steps and avoids the danger of false results caused by coding errors. Simply insert the test strip into the test strip port—located at the top of the meter—and the Clever Choice Voice+® automatically turns on. It talks the user through the setup steps, testing and memory recall. The Clever Choice Voice+® is easy to use while providing safe, accurate test results every time. Raised, imprinted buttons, complete with a repeat and scrolling feature, make it easy to navigate for the blind. Advanced bilingual (English/ Spanish ) talking function embedded that guides users through each step with repeat function and volume control.